Nuclear AMRC has signed a new agreement with Canadian Nuclear Laboratories (CNL) to work together to develop new clean energy and next-generation nuclear technologies. With state of the art facilities on the Advanced Manufacturing Park (AMP) in Rotherham, the £25m Nuclear AMRC is a joint initiative with industry, The University of Sheffield and The University of Manchester's Dalton Nuclear Institute, and is designed to help build and enhance the UK's civil nuclear new build industry. CNL is Canada's premier nuclear science and technology organisation. CNL is a world leader in developing peaceful and innovative applications from nuclear technology through its expertise in physics, metallurgy, chemistry, biology and engineering. Mark Lesinski, president and chief executive officer of CNL, and Andrew Storer, chief executive of the Nuclear AMRC, signed the memorandum of understanding (MOU) at the Canada-UK Energy Summit in London. The annual conference aims to expand ties between the energy sectors in Canada and the UK, both of which are committed to combating climate change by transitioning to low-carbon, low-pollution and resource-efficient economies. Under the agreement, CNL will join the Nuclear AMRC as a tier one member alongside leading nuclear organisations from around the world. Lesinski (pictured, left), said: "Both CNL and the Nuclear AMRC are committed to fighting climate change through the advancement of clean energy technologies, and this MOU allows us to work in partnership towards that end. "For CNL, membership offers tremendous benefits, including access to unique capabilities and training programs, participation in cutting-edge manufacturing innovation projects, and networking opportunities with some of the world’s leading nuclear organisations. In turn, CNL can offer the Nuclear AMRC access to our expertise and facilities from a wide range of nuclear science and technology disciplines. Overall, the MOU builds on the close relationship between both countries, and paves the way for a bright future in the pursuit of clean energy technology." 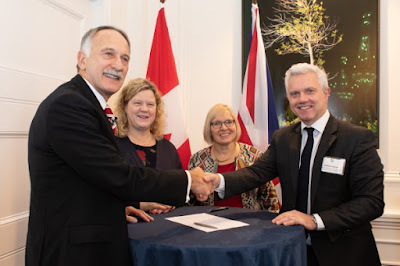 Storer (pictured, right), added: "We are very pleased to be strengthening our collaboration with CNL, which is a testament to the longstanding relationship between the UK and Canada in driving innovation in the global civil nuclear industry. Working closely with CNL will give us access to world-renowned engineering expertise and additional manufacturing research programmes linked to the development of small modular and Candu reactor technologies. We look forward to building a prosperous partnership with CNL in the years to come." Many of CNL's technology areas intersect with those of the Nuclear AMRC. The two organisations intend to collaborate on fields including materials characterization and performance, and advanced manufacturing methods for small modular reactor (SMR) safety-critical components. Lesinski, added: "CNL is currently undergoing a major transformation, funded by a $1.2 billion investment from Atomic Energy of Canada Limited (AECL) on behalf of the Government of Canada, to revitalise our Chalk River campus and renew our science and technology programs. As part of this transformation, we are working to develop new products and services that include the deployment of SMRs, the use of hydrogen to decarbonise Canada's transportation sector, the development of new methods to fabricate next-generation nuclear fuels, and many others. "These programs are ambitious in scope, and will certainly require the expertise and technologies of key partners – such as the Nuclear AMRC and their UK-based membership – to fully realise their potential."